The council has now begun its annual Christmas tree collection and recycling service, but is appealing to residents not to dump unwanted trees on pavements or street corners. Trees will be collected from the front of households on normal refuse and recycling collection days until Tuesday, January 18. 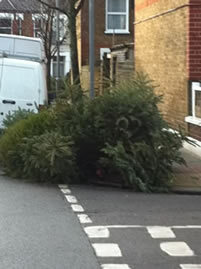 The trees are collected free of charge as part of the borough’s regular refuse and recycling services. All the trees will be shredded and turned into compost. Residents are requested not to leave trees on pavements unless there is absolutely nowhere else at the front of their property to leave it. Trees should only be left out on normal collection days and not before. The trees on the left are on the corner of Felsham & Fanthorpe Rds! Residents who live in blocks of flats should leave their trees near to their refuse bin store, making sure they do not block access to the bin store. “The council’s refuse collectors will be working hard over the next fortnight to remove unwanted Christmas trees free of charge. These will be picked up at around the same time that we take away normal refuse and recycling sacks. “Residents only need to leave their old trees in their front gardens and we will take them away. There is absolutely no need to leave them out on pavements unless you live in a property whose front door opens directly out onto the highway.